There is chaos under the heavens, and the situation is excellent. Website STILL unpublished, exceeds 300 visitors. Shop Notes department new this issue. 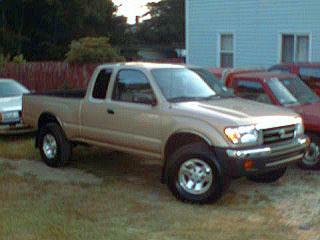 Newest tool in the shop, a Toyota Tacoma. The new Millennium Falcon? From Charles Toyota in Norwich CT. You don't feel like you need a shower afterwards. A millwork job on deck: Victorian porch parts. Boat fund started, enough for 4 feet of boat. Jacques Cousteau had the Calypso, so why not. Temperatures close in on 100, reach 77 in the shop. Water pressure down, well well well. A heat wave and... No rain for a month. A crime wave... No wallet in the morning. A nice wave... Time to head out in the Ocean Kayak. Some credit cards returned, but... too late. 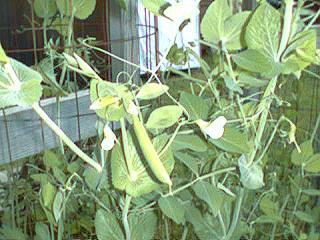 Sugar snap peas producing by the pound. Half of the new grass dies during the last beach trip. Time is growing short, enter the Web Page Contest soon and show off your new skills. Special Features (When ya don't know where else to put it). Back Issue Number Six, closing in on number one. Shop Notes - An in depth look at the shop and production. State Of The Situation - A quick overview of what's up and what's down. Monday - 7 Hazy, hot and humid. 100 degrees in Providence RI. It's a heat wave. Tuesday Hazy, hot and humid again! 96 in Providence. Wednesday At 8:00 am clouds rolled in fast, temps drop 20 degrees. Nice. Thursday Cool, sunny, very windy. Good sailing day. Friday Cool, breezy and sunny. Mid 70s. Perfect. Saturday Cool, mid 60s, windy and cloudy. Sunday Same as Saturday. This works for me. Monday - 14 Warmer then Sunday, sunnier. Tuesday Warm and breezy during the day, low 60s in the morning. More perfect weather. Wednesday Cool, overcast and windy. Friday Same as Thursday. Too good to be true. Saturday Warm days, cool nights. Yaba... daba... doo. Sunday More of the same. Monday - 21 Warm, sunny, breezy. Wednesday Warm, sunny, breezy (Notice a pattern). Thursday Warm, sunny, breezy (No rain either). Saturday Hot and humid, sunny, 96 again. Sunday Sunny, hot and humid, 1st night not in the low 60s, here we go. Monday - 28 Oh no! Summer's here. 75 degrees inside first thing in the morning. Hot. Wednesday Did I mention it was hot? Well it is. Friday Hot and sunny, west wind, cold water. Saturday Hazy hot and humid, west wind, flies, water temps in the 50s. Sunday Hazy, hot, humid. 80 at 7 AM. June marked the beginning of warm weather at the shop. Do you remember night time temperatures in the thirties in May? The last few days of June saw daytime temperatures hovering around 95 degrees. This all means that summer is here, landscaping work is over for a few months, and watering and mowing are the only outdoor activities that don't involve boats or beaches. So far, the shop has stayed cool and comfortable, with only two days in the mid seventies (inside). This is due in part to the two large Maple trees shading the building and yard, one of which needs to be taken down soon. This will allow more fall and winter sun in the windows, but may raise summertime temperatures inside to uncomfortable levels. Awnings may be a future project. 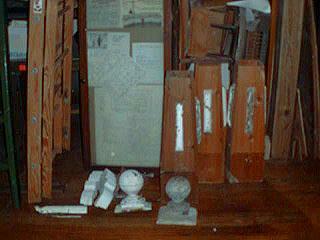 The arrival of samples of Victorian decorative components from Tivoli New York marks the reactivation of the shop after a layoff for landscaping and some light duty recovery time from the injury pictured below. The cool shade of the shop is a good place to hide from the scorching weather so the reproduction components should be complete by mid-August and ready for installation. August should see the completion of the production line, and sawdust flying for real, not just test pieces and in-house work. Renovations to the sales office will be complete, and a neater, greener, and landscaped front yard should provide an inviting welcome mat to prospective customers, vendors and visitors. After paddling long and hard to pick up speed, the shop is ready to catch the wave and ride it to shore. The next few months will be very exciting indeed. 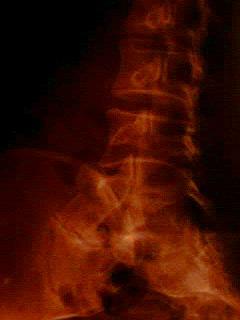 An oblique X-ray with an arrow pointing to the offending fracture, never before seen on a frontal or lateral shot. Looks like more then normal wear and tear to me. The new Millennium Falcon, in "Sierra Beige Metallic" with an "Oak" interior, sitting in the driveway at last. The newest tool in the shop is a four wheel drive "xtracab" with bucket seats, air conditioner, cd player, electric windows and door locks and even cruise control. 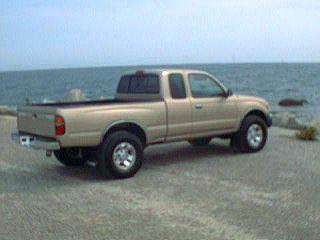 The new truck in Stonington because it was just too hot in Hooterville. The engine is a 190 hp 3.4-liter four-cam, 24-valve electronic fuel injected V6 with a 5-speed manual transmission. This will easily pull a 5,000 pound trailer when a class III receiver is added. Old faithful gets some New oil. 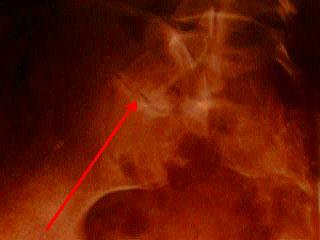 The head gasket leak causes coolant to leak into the oil supply. This would cause corrosion and possible damage from over-filling the oil pan, so the coolant was drained. 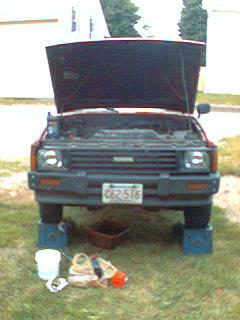 Fresh oil and filter will help keep the engine intact and running until the head gasket can be replaced. This will make a good fall project and keep the Millennium Falcon in service as a "Yard Truck", doing messy moving and towing jobs around the yard. The last repairs to the port side retaining wall are nearly complete. This eight foot section is the largest repair to date. 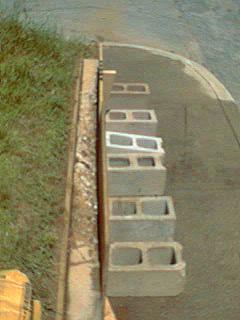 The concrete blocks hold the forms in place until the concrete sets. 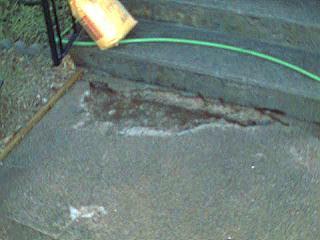 The last damage to be repaired on the walk leading to the front stairs. The walk repairs will allow the portable loading dock to sit firmly in place on the walk, allowing great loads to be moved safely, if not easily, into and out of the shop. 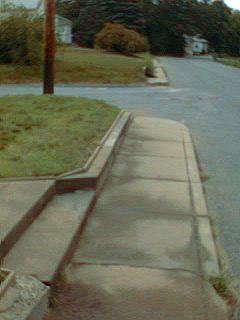 This is the second repair to this area of the walk. 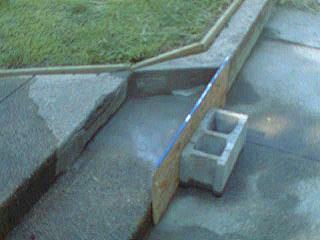 The first repair filled in the corner of the retaining wall. This follow-up will rebuild the stair tread itself and make the whole stinkin' thing look nice, hopefully just in time for the town to tear it all out and replace it for real. 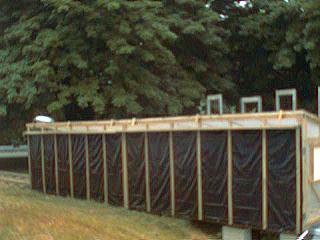 A view of the complete port side of the retaining wall, stairs, and some of the front walk. The repairs dress up the appearance of the entrance to the sales office quite a bit. 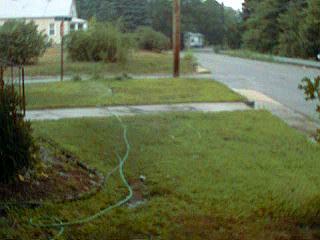 The grass (weeds) is filling in nicely as well. Usually by this time of year, the whole lawn is burned out and scary looking in front. The last repair to the walk complete. 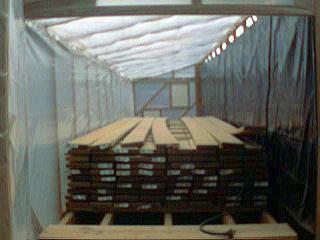 Not perfect, but good enough to support the weight of the loading dock and truck during loading and unloading. 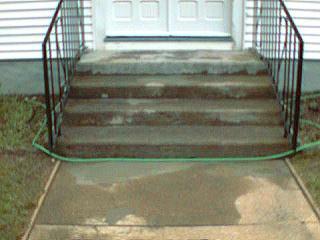 The erosion damage to the stairs caused by the roof drip line was repaired as well. 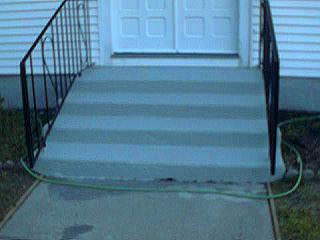 The front stairs received a coat of Harbor Gray Behr solid color stain to match the foundation. This was typical of the weather for the last week of June. 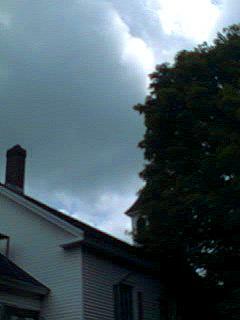 On the verge of thunder storms for days on end, but no relief from the heat and humidity, and NO RAIN. 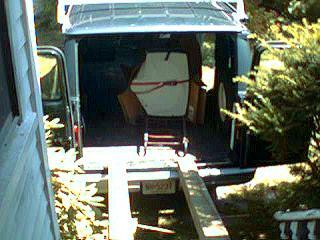 Todd's five hundred pound wood stove ready to move from the van to the porch on its way to the dining room. So much for light duty. The move went without incident. No damage to the stove, or the movers (us). 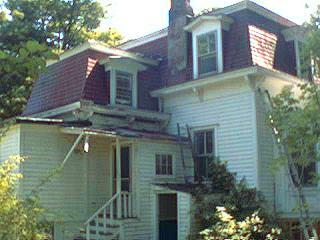 Off to Tivoli New York for two days to collect samples of decorative and structural elements of a Mansard Roof Victorian, to be reproduced for a complete restoration, in record time. 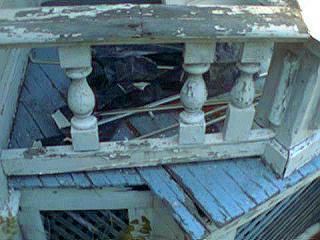 The left front corner of the porch, showing damaged tongue and groove decking and missing spindles. The spindles are actually half spindles, so one whole one cut in half on the band saw makes two for the porch. Missing and damaged trim around the front bedroom window. 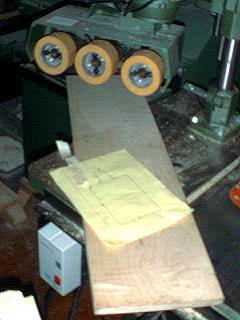 This stock will take six passes through the shaper to reproduce the profile. It doesn't make sense to order a custom set of cutter blades for less then two feet of trim. 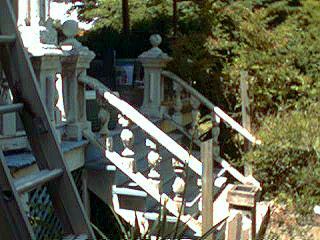 The front stairs, with the one remaining, heavily damaged post visible near the bottom of the left railing. Notice the missing spindle here as well. It's been a while since I've done any turnin'. Time to dust off the lathe. 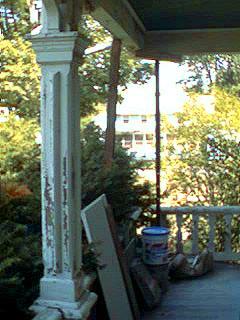 The decorative, but structural, posts holding up the porch roof. Slightly more intricate then the 4x4s used in most new construction. 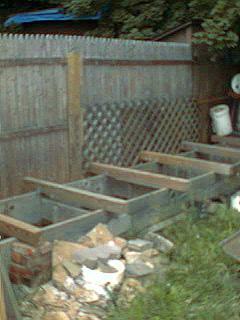 A railing corner post, three of which need to be completed for the two sets of stairs leading to the two doors that open out onto the porch. 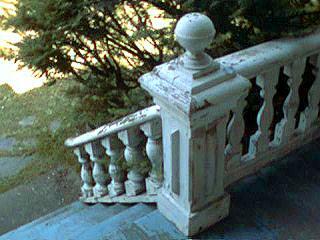 Notice the half spindles on the porch railing (good), and the full spindles on the stair railing (bad). The fascia boards and some trim over the kitchen need replacing due to rot cause by years of clogged gutters and down spouts. 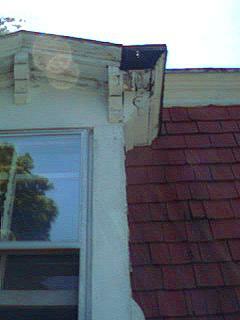 The corbels supporting the gutters are luckily all solid although one or two are loose. 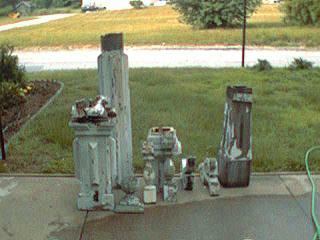 A pile of parts in the shop, all of which will serve as guides for fabricating replacements. Plenty of lead based paint chips for a quick snack. Tastes like chicken. The frame lookin' thing in the background is a message board from a Congregational church near Stafford Springs Connecticut. Another interesting church story. The whole collection quarantined out front for a while to allow the remaining carpenter ants to jump ship before bringing the mess into the shop. Look at how nice that grass is coming along. A drawing and some stock for the prototype of a cutting-board-pizza-paddle type thing to be used in a refrigerated case to slice and sell smoked salmon from. The finished product is 7/16" thick and guaranteed not to warp, unless it's run through a commercial dish washer, which seems to have happened. This is the type of little job that can keep a shop busy around the clock. A new department this issue, Shop Notes will focus on the shop itself, tools and processes used to produce furniture and other products. In this issue, we follow the path wood takes on its way into the shop. Wood arriving at the shop ends up here if the lumber dryer is full. This four foot wide rack can hold 4000 board feet of stock under a tarp, and may soon have a roof over it to allow air to circulate and start the drying process. The rack is located in the Ugly Area, a storage area for construction and landscaping supplies, boat and car trailers and other ugly items. This fence, and the plantings in front of it, conceal the horrors of the ugly area from anyone in the yard or driving by. It truly is an ugly area. The shed to the left is the tractor and garden shed moved here on a trailer from East Hampton. 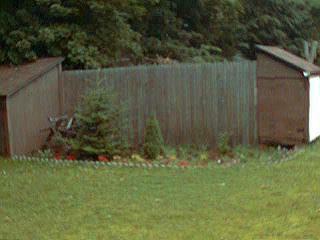 The shed on the right is storage for wood for outdoor fires. 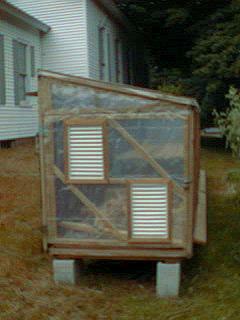 The lumber dryer itself is built from 2x2s and plastic sheeting on a 2x4 foundation covered with half inch pressure treated plywood. All wood in the dryer is pressure treated because of the high moisture conditions inside. The vents in the west door allow air to enter when forced ventilation is being used. Forced ventilation is necessary to reduce drying time in the event demand exceeds supply. This is a view of the large dampers that run the length of the dryer at the top in back, and at the bottom in front. Air heated in the dryer rises up and out through the vents in back, and draws in fresh cool air in front. This gentle drying process can have wood ready in two months. The dampers can be closed when the thermostat controlled exhaust fan is running to force ventilation. They also keep out rain and snow during storms. The back of the dryer is black plastic on both sides, with one inch Styrofoam insulation between the layers. This helps hold in the heat absorbed by the black plastic when the sun is on it. The lathe holds the plastic in place taking the strain off of the staples that attach it to the wooden frame. The lathe is held in place with decking screws to allow quick removal for repairs. Although it's twenty-five feet long and over six high, the dryer seems to fit into the yard well. 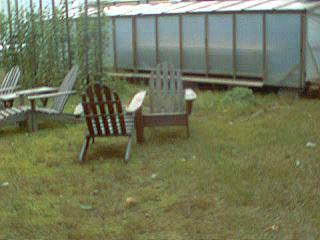 This is a view of the front of the dryer behind a garden of sugar snap peas and a Spooning Chair. Most people think it's a green house. It makes a fine one in a pinch. These tracks extend twenty-four feet from the east end of the dryer. The tracks support the huge weight of hundreds, and possibly thousands of board feet of wood as it's moved into and out of the dryer on a cart that looks very much like a rail car. A look inside the dryer with a small load of four-hundred board feet of store bought decking. 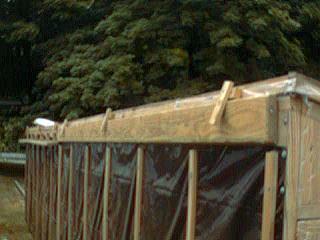 After drying, the rail car can be moved with a firm tug with one hand. 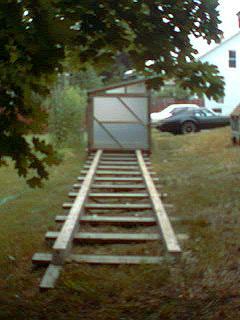 Before drying, the rail car needs to be pushed in with a truck. For all it's simplicity, the dryer works quite well, and although lightly built, has withstood a twenty-two inch snow load and gusts over sixty miles per hour with no damage. Water everyday, there's been no rain. It's that simple. 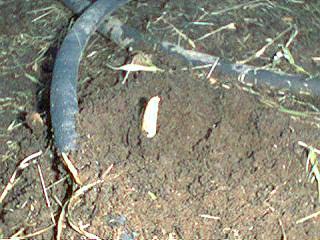 Diazinon can help control insects, which seem to be drawn to the oasis of the garden in this dry weather. Beans, Beets, Chinese Cabbage, Collard Greens, Cucumbers, Kale, Lettuce, Radishes, Rutabagas. Brussels Sprouts, Corn (yes corn). The latest tool in the tool shed: a Ryobi 15 inch string trimmer. 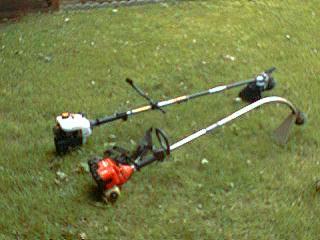 This baby has a brush cutting attachment and lots more horsepower then the trusty Homelite. 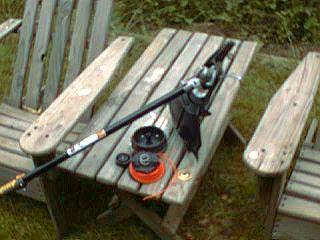 Almost finished the yard once before pulling apart the string spool to fix a jam. String trimming the ugly area involves moving all kinds of trailers and other nonsense. 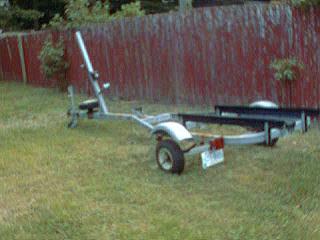 This is the Mutineer trailer, easiest to move. Notice the rust spots needing paint. 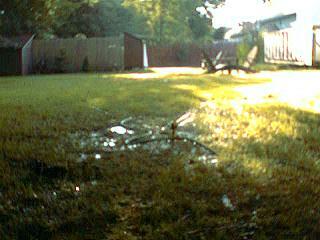 A very green, shaded and wet looking yard under a big maple tree. 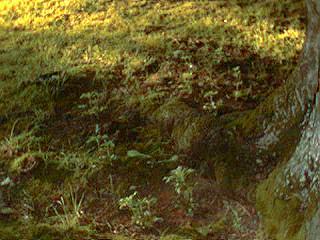 The constant watering is filling in the bare spots with new grass and moss, giving a natural "woodsy" look. 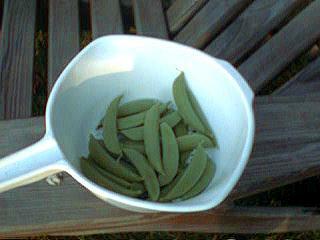 The first sugar snap peas harvested this year. A small amount, but enough for a generous serving of Beef With Pea Pods. Healthy pea vines after the first picking, ready to start delivering peas by the pound for the next four or five weeks. Every flower will be another pea pod. Each pod on the vine now will be ready in another week. Some of the sixty Pachysandra planted around the base of a large Maple tree. The roots at the base of the tree make it difficult to mow. The Pachysandra should solve that problem in a year or so. Weeks after all hope was lost, the first Elephant Ear sprout is up. 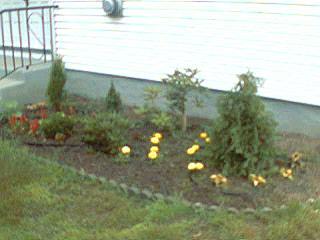 The planting outside the ugly area showing good growth. The latest addition is a Chocolate Mint plant along the fence and plenty of weeds, soon to be controlled by a thick layer of bark mulch. 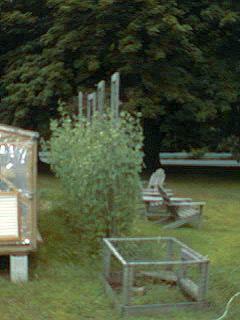 Pea vines nearing the top of their eight foot cages and ready to start producing pounds of peas every week. Pea picking number three. Enough for Beef And Pea Pods for dinner and leftovers for lunch the next day. A cage of vines loaded with peas just days after the last picking. 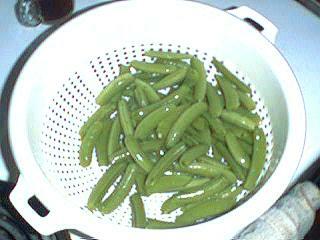 Sugar Snap pea pods are still sweet and tender even when the peas are shellin' size. 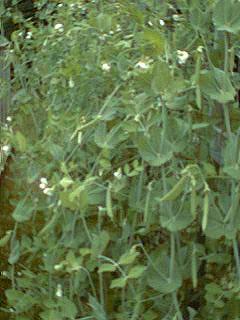 The pods take about two weeks to get stringy and inedible so you can go away for a week or more and come back to a great pea crop. One reason to leave the beach. One. The new front yard grass looking thick and green in the afternoon shade. This time last year the yard was desert dry and parched looking. It's amazing what a few thousand gallons of water can do. This is the last year of unlimited water use under the new water company's control. Time to drill a well for service water next year. Should be less then 100 feet down to river water. 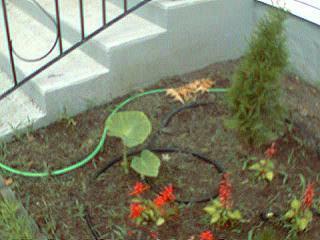 The lone Elephant Ear's leaves unfurled and growing fast. The Elephant Ear plants in Queen Victoria Botanic Gardens in Vancouver have leaves five feet wide. Maybe in thirty or forty years this one will be the same size. Stay tuned for the July 2029 or July 2039 Sandpiper. 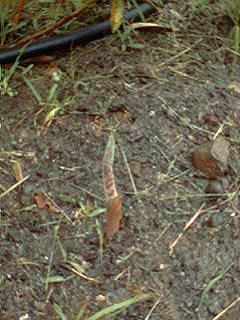 A Caladium sprouting, long after they were all given up for lost. They love hot weather, and are best started inside early and transplanted into the June garden to soak up the heat and lots of water. They need to come out in the early fall as well, before any possibility of frost. 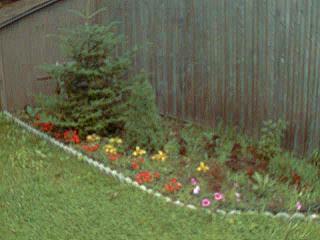 The front planting after two months of growth with some Marigold blooms and Coleus adding a bit of color. Time for a thick layer of bark mulch from the local saw mill to keep weeds down and hold in moisture during the hot weather. 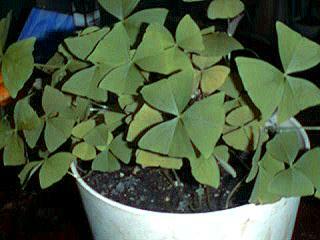 A ninety-nine cent Shamrock plant from Saint Patrick's day 1985, recovering nicely from a recent trauma. They seem to need repotting every three or four years. I should split this one into two or more plants to make sure it survives. 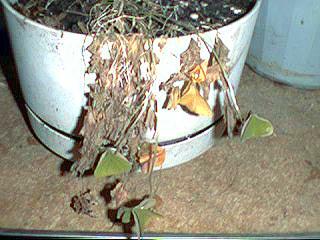 This is what the Shamrock looked like before being rescued. It can be fine one month, and then collapse the next. This was a close call, almost as bad as the time it froze. 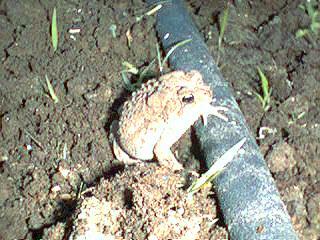 The former parched desert like front yard has become home to a number of fat healthy looking toads. They thrive on the insects that thrive on the plants, although the insects seem to be able to eat the plants faster then the toads can eat them. I don't want to spray with Diazinon because it would leave the toads in a bad way from the chemical, or lack of bugs for lunch after it kicks in. One must also be very careful string trimming around the gardens as well.